There are some event invitations that drop in your inbox that you just cannot ignore. Events so enticing that you will drop everything to attend them. 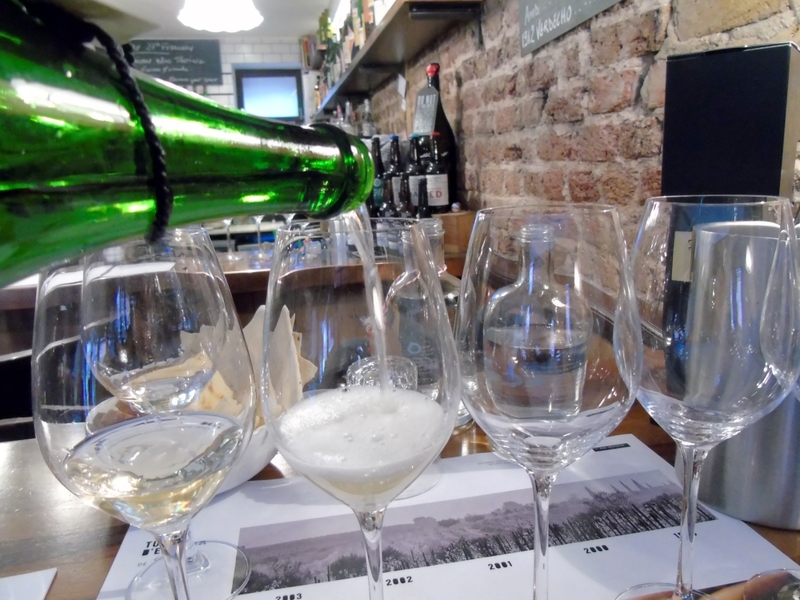 So, the day before I left for India when I received an invitation from my old friends at the wonderful artisanal, organic and often biodynamic cava house, Recaredo to join them for a very special tasting at The Remedy in London I could not say no. I booked a day off work, procured travel tickets and then waited, almost too excited to speak. A family affair since 1924, we were privileged to be joined by several members from the third generation of the family including Jordi Mata, who we had seen hand disgorging the bottles at the winery in May 2014. 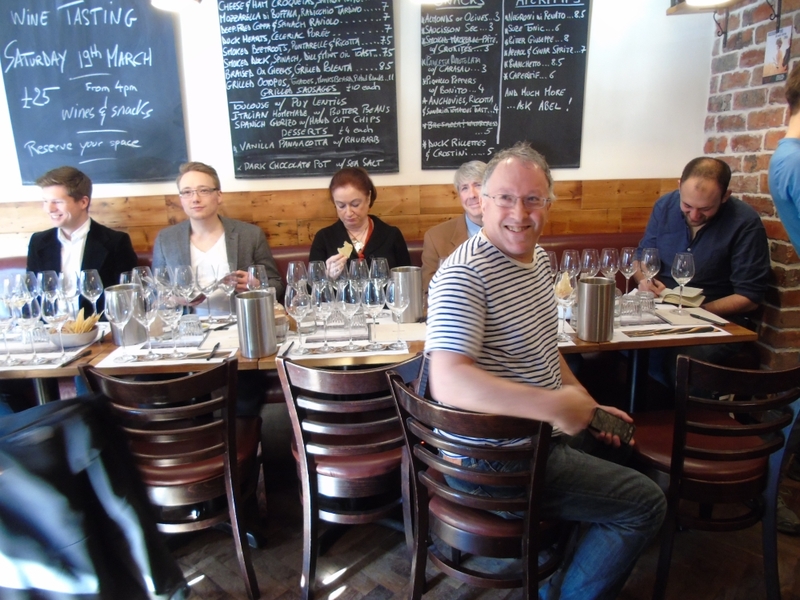 The event was hosted in association with Les Caves de Pyrene, who are a fantastic distributor of more ‘natural’ wines, made with the minimum of chemical intervention. I definitely recommend you check out their website if you haven’t already, it’s a great place to find some awesome quality wines from smaller producers that it is usually really hard to source in the UK. Anyway, our small band of intrepid tasters assembled in the intimate, but airy Remedy at the allotted time on a surprisingly pleasant February afternoon, It was immediately clear that this was no regular audience that had been invited, but that somehow I had been invited to an event to rub shoulders with some of the most knowledgeable wine folk in London. This was pretty intimidating for an amateur blogger like myself, but everyone was wonderfully friendly and it made for fascinating conversation over lunch. 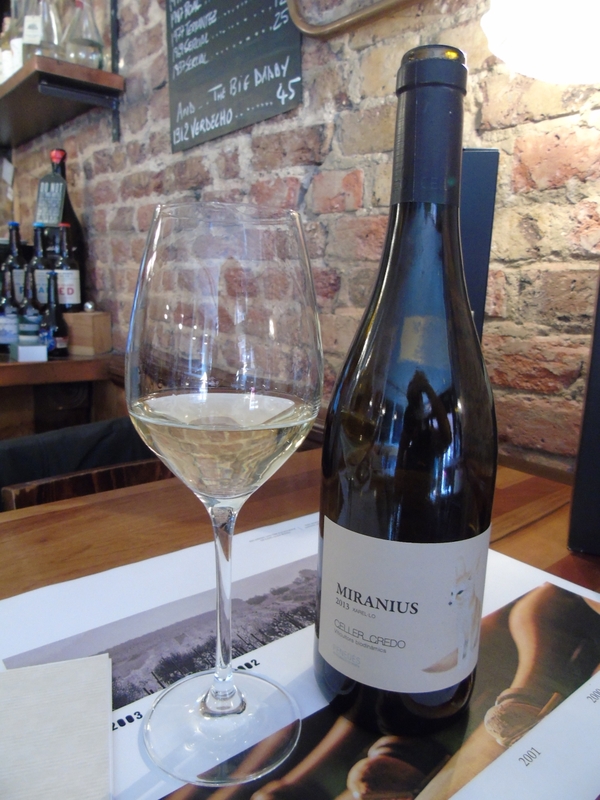 To begin, we were welcomed with a glass of Celler Credo’s Miranius 2013. Celler Credo is the name for the Recaredo family’s still wine operation and you can see that just as much love and care goes in to these wines as goes into their cava. This was also one of the first biodynamic wines to be made in the DO Penedes. Made predominantly with one of my favourite grapes, Xarel Lo tempered with a touch of Macabeu, this pale golden wine is rich on the nose, full of spring blossom. In the mouth this is a dry wine with a fresh acidity that is refreshing but rounded, rather than crisp or sharp. Notes of orange peel, but also a slight minerality all interplay to create an easy drinking but interesting wine. This scores an easy 7 in my book, which perhaps is a little low, but I knew I was going to need somewhere to go in the scoring stakes at this particular event! We tried another Celler Credo Xarel Lo next, this time the unblended, biodynamic 2014 offering, Aloers. This was still a pale wine but had a slightly deeper colour than the Miranius. It was also punchier on the nose, with a slightly riper, more honeyed aroma, like a vineyard in the height of summer. It had great acidity, being much drier in the mouth than the bouquet promised. It was full of pear and stewed apple fruit, but not sweet or cloying, but instead with a great structure that fades out in the mouth with a light, breathy exhalation. A fabulous all rounder and just to my taste, although I would also give a 7 as I could not distinguish a difference in quality between the two. 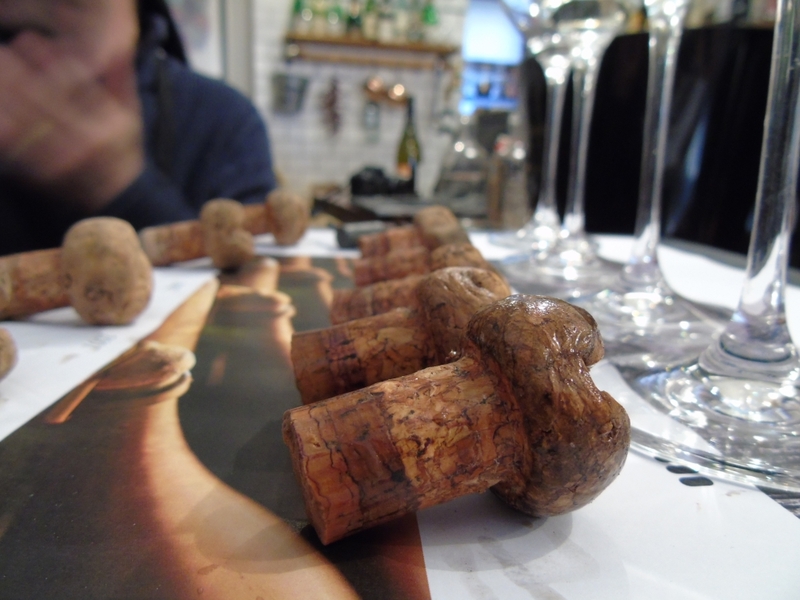 Next we were on to the main event, a side by side tasting of two series’ of cava. Instead of the usual second bottle aging process, these were extremely special wines that had not been disgorged but cellared on their lees. Recaredo uses corks rather than crown caps for the first bottle fermentation, believing that it gives the best conditions for the wine to age – although a higher oxidisation at first this then reduces over time, while a metal cap leads to slight, but continual growth of oxidisation over time. The really incredible thing is that of course the bottles were carefully turned over time to bring the lees to the cork end – and somehow they transported all of these bottles to London inverted! The mind boggles how they managed that and still kept the lees undisturbed. 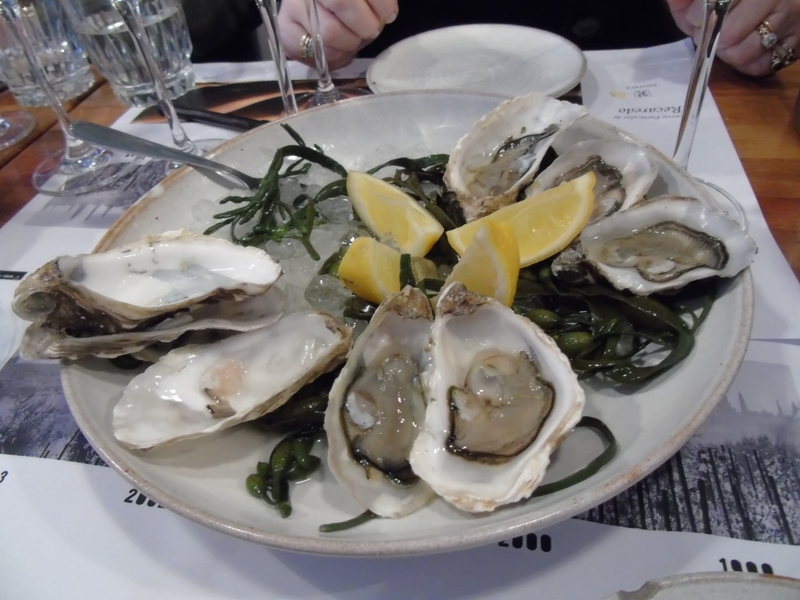 Their grandfather had first produced the Reserve Pelicular in 1962, and was considered rustic for his respect of tradition, using mainly Xarel Lo, but was also keen to innovate by using some Macabeu. 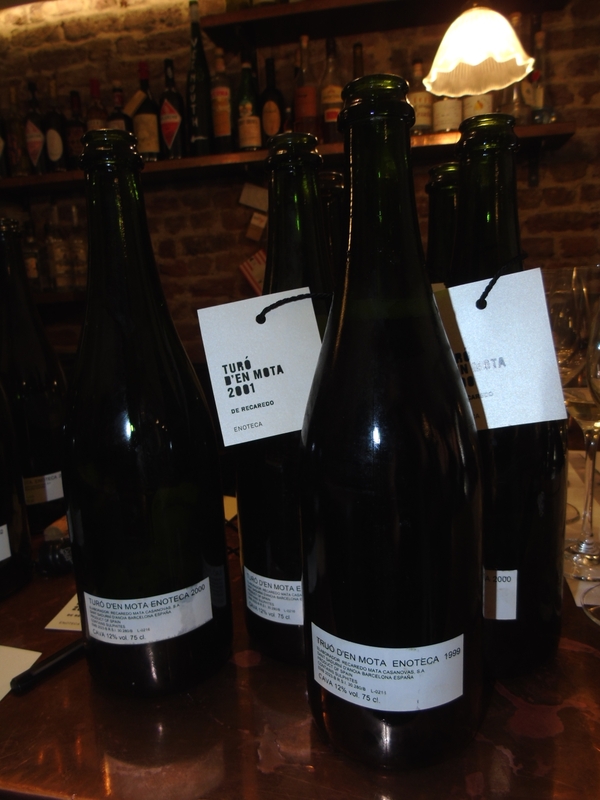 Of course they are all Brut Nature – a bone dry cava being what the Sant Sadurni makers value the most – but of course, dosage would occur after disgorgement in other sparkling production and therefore it was assured that no dosage could have been added. The vineyards are not irrigated and so each year takes on its own distinct character from the vagaries of nature in each year – 2003 for example being a particularly hot year. It demonstrates the absolute faith that Recaredo have in their wines that they were happy to disgorge the bottles right in front of us and allow us to taste them immediately. It is an honest representation of the wines, although they acknowledged that some of them could have been a little reduced. As another member of this wine-making dynasty, Ton Mata, told us, they simply wanted to show us a little bit of their soul. How beautiful. So the wines were expertly disgorged, year by year, in front of us by Jordi while Ton gave a vivid description of the vineyards, the way the wines were produced and talked with obvious pride about the quality of the cava his family created. Although they are not keen on the word ‘cava’, they think of them as much a terroir wine as any other – this was certainly not the cheap mass-produced wine which some people can think of when cava is discussed. The bottles were expertly sniffed, tasted and then promptly poured for the rest of us to try. This hand disgorgement and checking of each bottle is the same process that each bottle goes through at Recaredo, showing a real dedication to fine quality and master craftsmanship. 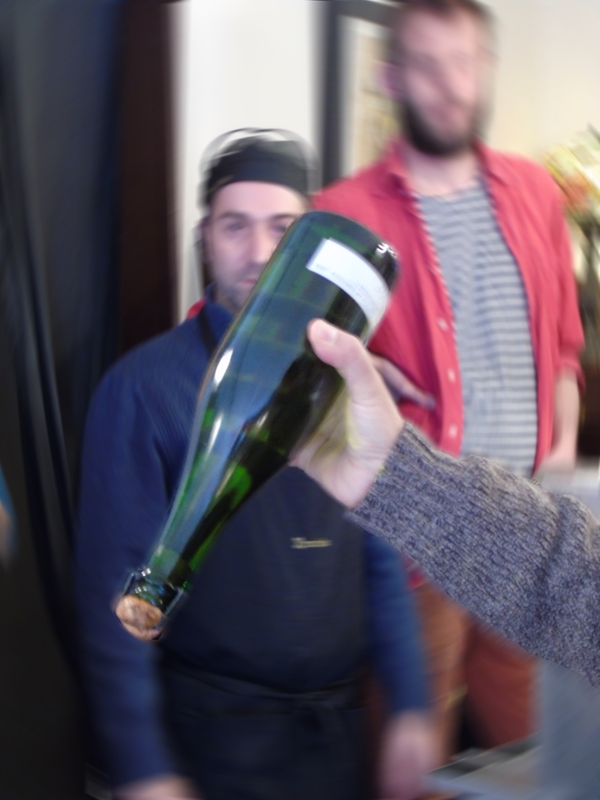 There is certainly no freezing of the bottle necks and machine disgorgement here! So, the Reserve Peculiar was first, the 2003, 2002, 2001, 2000 and 1999 – still alive and fresh cavas that had been patiently waiting for up to 16 years to be tasted. I don’t think there is value in writing tasting notes for each of these wines. They are exclusive and rare and in the main Recaredo will not let bottles out of their care. These are wonderful treats to be savoured and enjoyed. There are only 271 bottles of the 2001 for example. Well, 269 after our tasting was completed. The 2003 was from their most difficult harvest ever, which you can taste in the roundness of this wine, it was much more full of honey notes than the other years which had much more crispness and acidity. This was the consequence of the intense heat of that year. However, there was still plenty of orchard fruit to be enjoyed (although more stewed fruit than the earlier vintages) and that slight biscuity, perhaps brioche-like note. 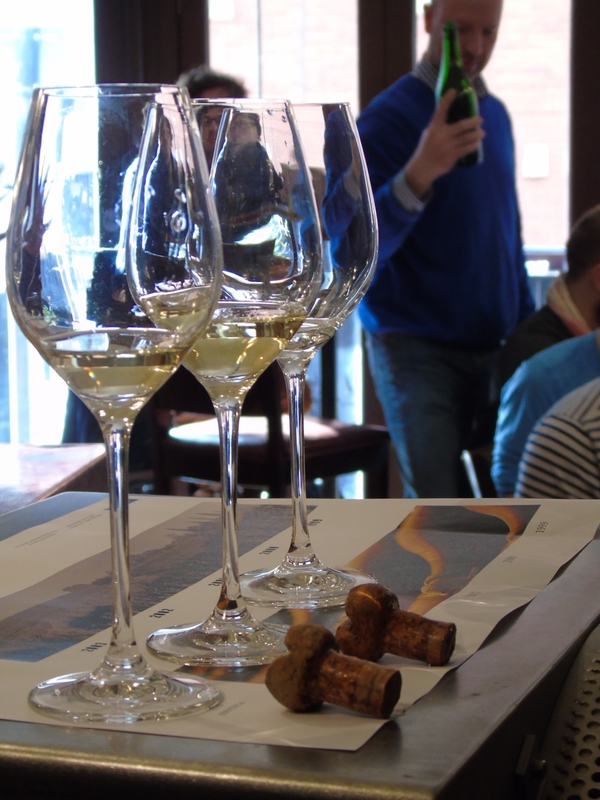 All of them had incredible mousse – soft, light bubbles – stronger in the 2002 than the 2001 which was the most delicate and complex of all of the wines. With the 2002 I found more light aromatic, floral notes were revealed as you drank, whilst the 2002 had fresh green apple and beautiful salinity as well as a barely-there toasted flavour. It was an absolute masterclass in tasting and understanding the effects of terroir on the same wine, year by year. They were so discernibly unique in their own character – the 2000 having more minerality on the nose, the 1999 holding its minerality in the mouth, to the point of having granite notes within it. The 2001 was hailed to be the finest vintage by both the group and the winemakers themselves but for me the 2000 was a close second, with an extremely subtle mousse, crisp apple flavours building a beautiful balance with the saline kick it gave – that one definitely grew on my. Next up was the Turo d’en Mota – which means small hill and refers to the vineyard in which the grapes for this series were grown. This north-facing vineyard (as grapes for this wine are better without the sun to keep that acidity popping) was started in 1999 by our hosts, the third generation of the family, with the support of their parents. Ton Mata was 28 when this wine was first made, and 38 when the first bottle was sold, so it shows the dedication and confidence that must be had. This was one vineyard, one grape, one terroir so the only change between the wines was the year. Again we worked our was back from 2003, that very hot year, down to 1999 – each bottle carefully disgorged, checked and then immediately sampled. I cannot stress enough how magical a side by side tasting is to really challenge your palette. The 2003 was amazingly crisp and sharp, but yet somehow well balanced with tight, expressive bubbles – incredible for such a hot vintage. The 2002 was a little reduced when opened which meant I did not score it as highly as the 2003, but the earthy, mushroomy dirtiness on the nose did fade slightly over time, although not completely. Was it just that bottle or the whole vintage? I don’t know – I should have asked! The 2001 had much more depth – a hint of old oak, dryness, minerality, a beautiful toasted note across the whole palate but the overwhelming flavour note being salt – which was much more wonderful than it sounds – a straight up no questions asked 9 out of 10 of a wine. And finally, my two favourites of the day. This is where my note taking got difficult. The 2000 took my breath away and my wine notebook has the furtive scribble “IS THIS A 10?” written on it for this wine. I’ve never given a 10 before. It was rounded, creamy and fruity on the nose, all at the same time. When you tasted it, it had all of those elements but also toasted cream (I know, that doesn’t make any sense, but that’s what it was) and a very slight honey at the back. Beautiful texture, incredible wine. It makes me weep with joy to think of it. And the 1999, I compromised with a score of 9.8. Suffice it to say I loved it. By far the most powerful on the nose, it was full of floral aromatics, light bubbles and a great explosion on the mouth with beautiful acidity and the benefit of amazing maturity. It made me a happy, happy bunny. After this, it was time for lunch. The Remedy provided beautiful food which we could experiment in matching the cavas to. 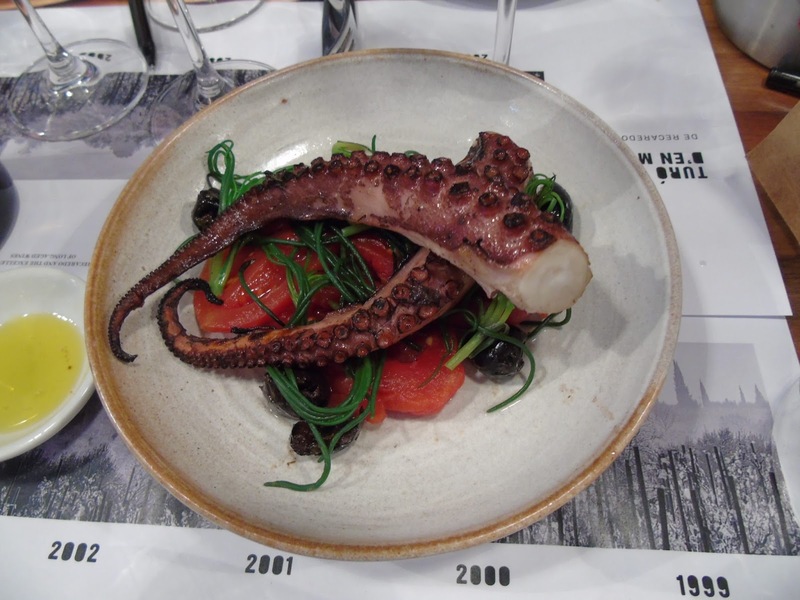 Of course, the oysters won the day, but I also loved the texture and deeper flavour of the octopus along with the Turo d’en Mota. If you haven’t popped along to The Remedy they do have an excellent tapas menu and an even better wine menu and I think an afternoon or evening of lazy food and wine pairing there would be a great way to idle away some time. My thanks to Les Caves de Pyrene, The Remedy and of course to all the wonderful people at Recaredo for inviting me along to such a unique and memorable afternoon. I’m well aware that I’m gushing but I simply cannot overstate the quality of these wines and the utter joy that this side by side tasting evoked in me. I think I’m going to have to go and have a little lie down now.